Where do University of Georgia students sate their late night cravings when the dining hall is closed? A lot of places, luckily. Athens is brimming with some of the best restaurants in the state, and there are plenty of them that cater to the late-night college crowd. It’s the best way to get a good meal without disturbing your snoozing roommates. Night owls get ready—these are the 10 best late night college food spots near the University of Georgia. Open til midnight, the Foundry is one of Athens’ hottest food and event venues. With a menu smothered in southern comfort food, there’s no shortage to deliciousness. You’ll also discover several local brews and small plates to suit your appetite. We are so excited to team up with Nuçi's Space to help prevent suicide this month! $7 from every turkey plate is donated to help provide resources to musicians and others living with mental illnesses. Even better than late night food is 24-hour food that keeps you fueled whenever you start running on empty. You can find just about anything to suit your cravings, including milkshakes, burgers, and their amazing Feta dip! It’s an Athens tradition you’ll want to be a part of. These warm, gooey cookies are baked fresh to perfection after you order them, meaning you’ll never get day-old staleness here. Choose from a variety of flavors, from classic chocolate chip to s’mores and chocolate peanut butter cup. If you’re too busy (or too lazy) to go get them yourself, just have them delivered to your dorm. With one of the most extensive menus in town, you can satisfy whatever your rumbling stomach desires well after the dinner rush has fled. 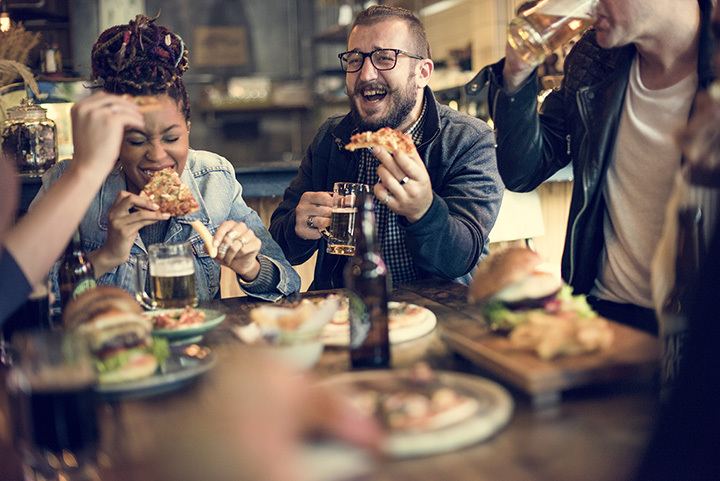 Sure, it’s a chain restaurant, but their made-from-scratch offerings and fresh flavors will have you rethinking your dining choices. Quirky, fun, and a little on the dive side, this charming diner is the perfect spot for late night eats. Portions are generous, taste is exceptional, and prices are college budget-friendly. Open til midnight on the weekends, this place will soon become your go-to pot for burgers and fries. You’ll come for the late-night fare and leave with a funky souvenir cup that screams awesome sauce. Every night features a different specialty, sometimes including the chosen food of the college crowd—ramen. You’ll love the neighborhood feel and friendly service that treats you like you’ve one of the gang. Barbecue isn’t an easy-to-find thing in the early hours of the morning, but this tasty barbecue joint changes that. You can get their classic barbecue with home-cooked side dishes just about anytime your hunger strikes. You’ll want to write home about this place! Aside from a pleasant atmosphere, the food options here will make the Iron Factory your new favorite nighttime dining spot. This Korean-style barbecue is among the most unique cuisine in Athens, and is more than worthy of a taste. Open until midnight or later, there’s something on the menu to calm any appetite. Need a quick late night bite? Transmetropolitan specializes in pizza by the slice and other fan favorites, including appetizers, burgers, paninis, salads, and more. The only downside is that they’re only open til midnight Thursday through Sunday. Hopefully your pizza cravings will coincide. Yes, UGA has its very own late-night food hot spot. Open 24 hours Monday through Thursday, students can enjoy midnight munchies and breakfast throughout the wee hours of the morning. You won’t even have to leave campus to get your fill!